There are always a few movies that come out and make you wonder, "How did this get made?" Season of the Witch is that kind of movie. It opens with a hanging of three women who are accused of witchcraft. They try to convince the priest of the their innocence and of course he wont hear it. Afterwards the priest attempts to read the women their last rites but everyone else is satisfied that they are dead. One woman comes back, kills the priest and begins her reign of terror. 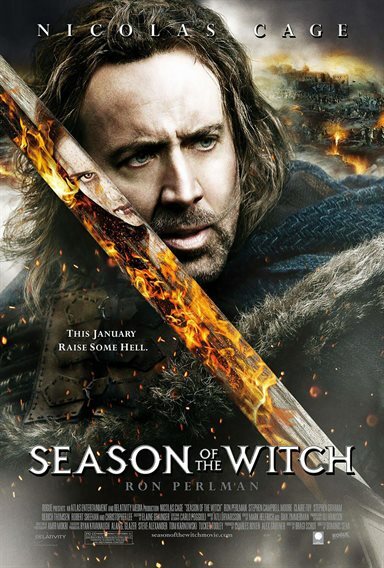 The movie then jumps to our main stars, Nicholas Cage and Ron Pearlman, who play Behmen and Felson, best of friends who are knights fighting during the crusades. We watch a montage of battle scenes culminating in a final charge upon a town where amidst the calamity Behmen kills a young woman. Realizing the error of his ways he and Felson desert their unit and go wandering around the land. They happen upon a town where a mysterious plague has swept over the land. They are discovered as deserters and brought in front of the bishop, he tells them they must help bring a witch to an abbey north of their town and help put her to death so as to end this plague. After some back and forth they accept the mission. As they make their way north to the abbey they are beset by many disasters and pitfalls all seeming to be caused by the young girl. Behmen, still reeling from his guilt over the last battle he fought in, wonders if the girl might be innocent. But the girl keeps proving her guilt so eventually Behmen can no longer ignore the obvious. Eventually they make it to the abbey where things take a turn for the truly evil. Exactly what happens will have to remain a mystery; if you are someone who truly loves Nicholas Cage and his wonderful film choices as of late then you are sure to be heading to the theater this weekend to see this movie. Quite frankly this is just a poor movie; a weak plot, poor casting and terrible special effects. During the final scenes it was hard not to be reminded of that final scene in The Golden Child with Eddie Murphy where he battles that demon. This movie employs a similar sequence only this time it is more drawn out. Apparently a few years ago Nicholas Cage had to file for bankruptcy because of his outrageous spending habits. Perhaps it's because of this that he has been making these particular movie choices as of late. Regardless of whether or not he was in this movie it still wouldn't have been very good. The one saving grace of this movie was the locations in which it was shot. There were a few scenes, when it was obvious they weren't on a set, where we had some gorgeous shots of rolling hills and valleys. If they had shot more on location it might have done a better job of keeping the audiences attention. In the end, Season of the Witch is just another example bad movie making and bad story telling. What is truly amazing though; movies like these will continue to be made and there will always be people who are willing to go out and see them. Download Season of the Witch from the iTunes Store in Digial HD. For more information about Season of the Witch visit the FlickDirect Movie Database.